The smallest Recreation bike ever! 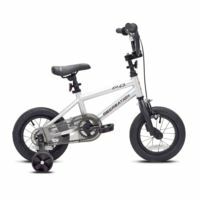 The alloy PO 12" comes equipped with training wheels & a coaster brake for the rad little kid just learning to ride. You're never too young to have fun a bike. For kids ages 3-4, between 36-40 inches tall. Color subject to change. The Recreation SC 16" may be small, but it packs a big punch. 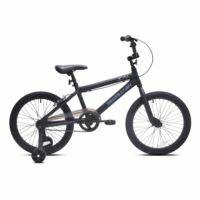 Built with a lightweight alloy frame, this bike is ready to zip around the playground. The training wheels and coaster brakes will be sure to build confidence when going out on new adventures. For kids ages 4-5 between 39-46 inches tall. Color subject to change. You'll be cruising around the neighborhood in style with the Recreation IN 20" Boys bike. 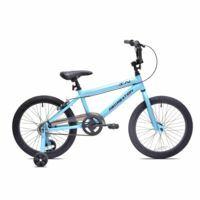 Featuring a lightweight aluminum frame, coaster brakes and training wheels, this bike will be sure to build confidence when going out on new adventures. For kids ages 6-8, between 45-52 inches tall. Color subject to change. 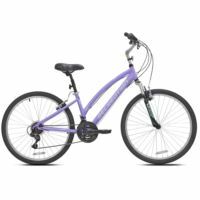 You'll be cruising around the neighborhood in style with the Recreation IN 20" Girls bike. 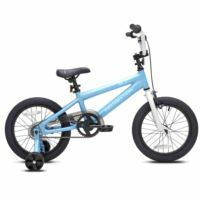 Featuring a lightweight aluminum frame, coaster brakes and training wheels, this bike will be sure to build confidence when going out on new adventures. For kids ages 6-8, between 45-52 inches tall. Color subject to change. 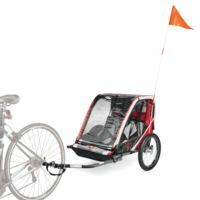 This fully-functional, 1-child fixed wheel jogger quickly converts to a 1-child bicycle trailer for additional functionality. The SST1 Steel Allen Sports Bicycle Trailer features large front and side windows that allow for your little one to enjoy the ride. 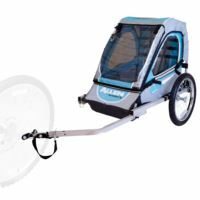 The Allen Sports 2 Child Trailer offers the perfect outdoor solution for active parents. 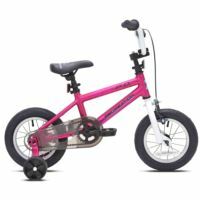 It's made out of lightweight steel and comfortably transports 2 children ages 1-5 (100 lbs. max). The universal coupler attaches to most bicycles and meets ASTM Safety standards. Recreation's Journey is perfect for fitness, commuting, or just plain old fun. 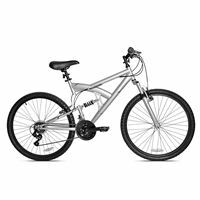 This hybrid has an alloy frame for durability and Shimano shifters that provide easy gear changes to manage any hill. Flats happen. Make sure you're prepared with a Bontrager Flat Pack, a convenient and useful all-in-one pack containing tire-change essentials. OnGuard's Doberman combo cable lock is tough and easy to use! With the Doberman, all you need is your bike, the lock, and a number you can remember - no keys necessary! 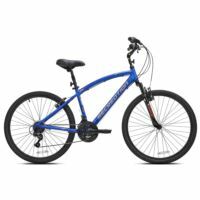 This 21-speed bike from Recreation is perfect for riding to the store or just relaxing with your family. The Northway features a comfort design alloy frame. OnGuard's Doberman combo cable lock is tough and easy to use! 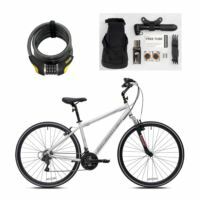 With the Doberman, all you need is your bike, the lock, and a number you can remember - no keys necessary! The BiKASE Handy Andy Easily mounts to bike with 2 neoprene straps. Bell's Radar bicycle helmet features True Fit - Just one simple adjustment for a correct fit every time. Fits iPhone (including iPhone 6), Androids, Samsung Galaxy and other 5"+ devices. Easily mounts to bike with 2 neoprene straps. 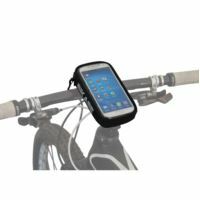 Simply wrap the straps around your handlebars, the stem, top tube, or even your backpack for easy access to your smartphone while riding. No tools required for this easy set up! This cell phone pouch makes calling or navigating with a GPS or training app simple. The see through window allows you to view information while keeping your phone or device protected with easy operation of the touch screen while in the pouch. Finally, an affordable entry level full-suspension all-terrain mountain bike! The Recreation ICO-SH's frame is constructed from Hi-Tensile steel so it will provide you with durability and comfort for years to come! 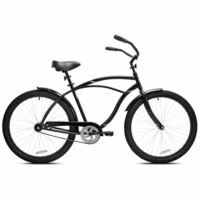 It comes fully equipped with 21- speed twist shifters, bar-ends, independent front shocks, and a coil-over rear suspension. Finished with attractive chevron detailing. Available in one standard size to fit most. Please note: This is not a Trek bike. Recreation's Journey is perfect for fitness, commuting, or just plain old fun. This hybrid has an alloy frame for durability and Shimano shifter that provide easy gear changes to manage any hill. The comfort suspension fork will make your ride a breeze. 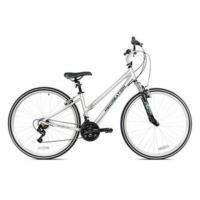 You'll also enjoy a comfortable upright riding position on this 21-speed bike. (Also available in a women's specific design). Recreation's Journey is perfect for fitness, commuting, or just plain old fun. This hybrid has an alloy frame for durability and Shimano shifter that provide easy gear changes to manage any hill. The comfort suspension fork will make your ride a breeze. You'll also enjoy a comfortable upright riding position on this 21-speed bike. 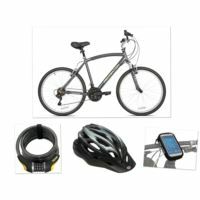 This 21-speed bike from Recreation is perfect for riding to the store or just relaxing with your family. The Northway features a comfort design alloy frame. It's made for a relaxing, upright riding position and features a plush saddle. A comfort suspension fork smoothes out the road or path. Easy to use Shimano shifter help you tackle the hills while linear pull brakes provide confident stopping power. (Also available in a women's specific design). 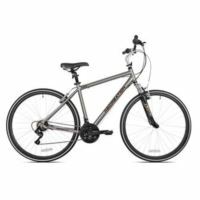 This 21-speed bike from Recreation is perfect for riding to the store or just relaxing with your family. The Northway features a comfort design alloy frame. It's made for a relaxing, upright riding position and features a plush saddle. A comfort suspension fork smoothes out the road or path. Easy to use Shimano shifter help you tackle the hills while linear pull brakes provide confident stopping power. 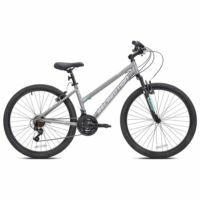 Recreation's SilverRidge SE is a 21-speed entry level mountain bike for the recreational rider. It's made of alloy for durability on the path or trail. The suspension fork gives you comfort and control over rough terrain. The Shimano shifter provides easy gear changes to manage any hill and the aggressive tires provide traction under adverse conditions. (Also available in a women's specific design). 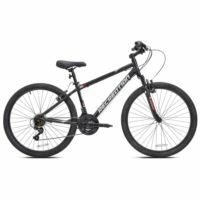 Recreation's SilverRidge SE is a 21-speed entry level mountain bike for the recreational rider. It's made of alloy for durability on the path or trail. The suspension fork gives you comfort and control over rough terrain. The Shimano shifter provides easy gear changes to manage any hill and the aggressive tires provide traction under adverse conditions.